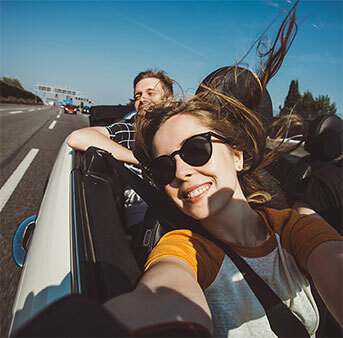 Road-tripping is a favorite hobby or pastime for many people. Whether it's a quick drive up to the mountains near Hendersonville, or a 4-hour drive to Myrtle Beach, preparing for your journey is absolutely essential. But what exactly does preparing look like? We've included a few pointers you can refer to the next time you get ready to hit the open road. Remember that, above all, safety is important. Whether you're cruising country highways or congested interstates, it's important to be aware of what's going on around you. Keep reading to learn more about how you can be ready. Probably the best thing you can do to avoid any hiccups on the road is to take your vehicle in for a mechanic to examine. A multi-point inspection will enable you to drive with more confidence and peace of mind. You'll also want the mechanic to check your brakes, especially if you'll be driving on any mountains or twisting roads, like those leading up to Brevard, NC or Table Rock. Another important thing to remember when planning for your road trip is to ensure your tires have plenty of traction. Not only do good tires help keep your ride on the interstate less bumpy, but they can ensure you have enough stopping power should you need to avoid an accident or stop for a pedestrian. If you're unsure about your tires, it's best to have your service department double-check. If you're traveling alone, or with just one other person, it's pretty unlikely that you'll max-out your car's load. However, if you're traveling with a family or several friends, overloading can be a bigger problem. It's important that you can see out of your rear view window and that nothing obstructs your ability to drive, but also that your vehicle isn't too weighed down. An overloaded vehicle will not handle as well and will be much more sluggish on the road, which can cause problems on the interstate when it comes to changing lanes or merging. Even if you have car chargers, it's a good idea to make sure your phone or device is charged beforehand. For phones, especially if you're going through areas with spotty coverage, the battery can run down quickly when it's constantly searching for reception. Data usage also tends to drain a phone's battery at a faster rate. In addition to your luggage, it's important to have extra supplies for the road trip itself. This could include items such as flashlights, extra water and extra jackets during cold seasons. It's also important that you always have a first aid kit and tool kit in your vehicle at all times, even if you're not on a long road trip. If you don't drink coffee, at least bring something to keep yourself awake. Particularly during long, straight drives, it can be easy to dose off at the wheel, which endangers you, your passengers and other drivers. At the very least, be sure to get a good night's sleep the night before you leave. If you don't have a GPS, ask a passenger to navigate for you on their phone or with a map. It's best to look at a map before leaving, in case your GPS loses signal or malfunctions. And if you're a trailblazer who doesn't need the help of a GPS, it's a good idea to pack one anyway in case you take a wrong turn somewhere down the road. Again, the most important thing to remember is that no destination is as important as the safety of you, your passengers and the other drivers on the road. No text is worth answering when you're behind the wheel, and no destination is worth speeding to get to. If you're not the one driving, be sure to keep whoever is accountable. If you're interested in learning more about how to prepare you or your vehicle for your next trip, or want to get it checked beforehand, come see us at Big 'O' Dodge Chrysler Jeep Ram in Greenville, SC, at 2645 Laurens Road, Greenville, SC 29607. We look forward to serving our customers from Spartanburg, Greer, Anderson and Easley.